On this day the 16th Ohio boarded the steamship St. Mary, which had been waiting for them at the Algiers, Louisiana, wharf. The troops knew they were bound for Texas, by way of the Gulf of Mexico, in support of another attempt by General Nathaniel Banks to invade Confederate held Texas. The ship, containing the 16th Ohio and the 69th Indiana, left Algiers about noon and steamed down the Mississippi River, entering the Gulf about 10:00 pm. Nov. 25th we went aboard the steamship St. Mary, swung out and started for the gulf. The air was cool, the bosom of the river smooth, and the view from the lofty hurricane deck interesting. The ship's crew was small in number, but were an active, industrious set of fellows. They busied themselves lashing the life-boats firmly to the davits and preparing the ship generally for the rolling sea beyond the Delta. When night came the colored lights were run up the foremast and the vessel kept steadily on. Forts Jackson and St. Phillip, facing each other from opposite sides of the stream, revealed themselves to us in the darkness by their array of small lights. These two formidable works and a ponderous fleet of iron rams and fire rafts formed a critical barrier to Farragut's wooden ships, at this point sixteen months before. However, when the old Admiral got ready he piped his men to their stations, passed the former and destroyed the latter, losing one ship, the Varuna, whose plucky crew worked their guns until they dipped water, and in the immortal vessel in a blaze of glory, went down. Two days after, the garrisons of the forts mutinied under their commander, Gen. Duncan, and the strongholds were surrendered to Gen. Butler, who with the land forces had not yet passed up. 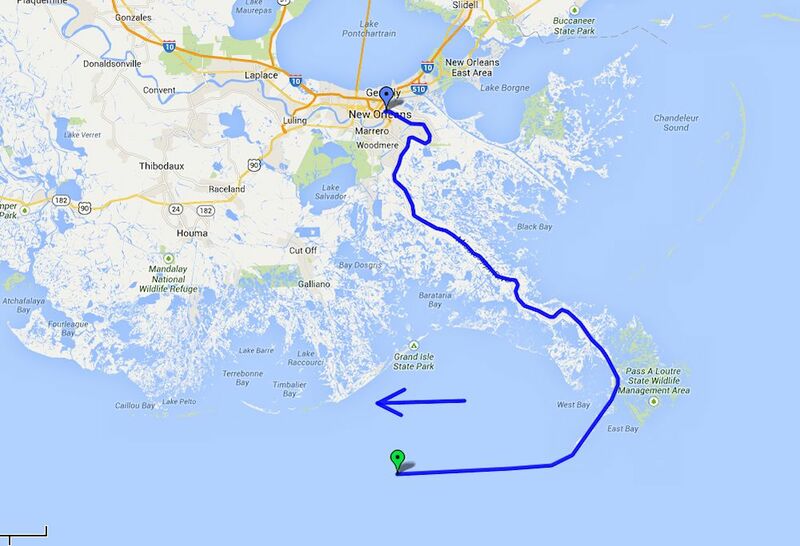 Some time during the night we entered the Gulf of Mexico, which we discovered by the rolling motion of the ship. This period map, original date unknown, shows the Mississippi delta region and allows us to annotate the route of the 16th Ohio, on board the steamer St. Mary, on the first day of its voyage to Texas, November 25, 1863. It cannot be determined as to the specific location of the ship at the end of the day so we will make an estimate, as shown by the red start at the bottom of the map. 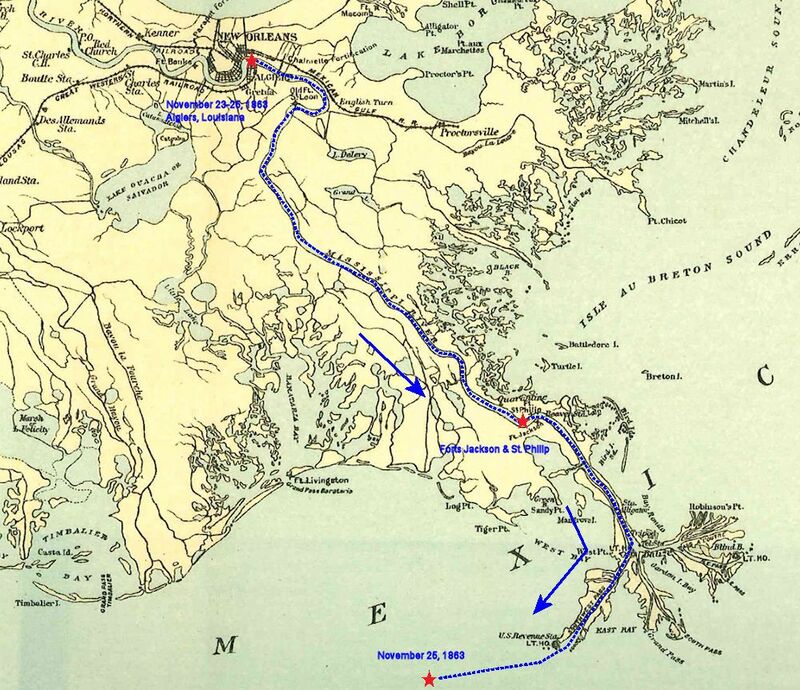 Modern day map showing the approximate route of the 16th Ohio on the Mississippi River from Algiers, Louisiana, into the Gulf of Mexico.